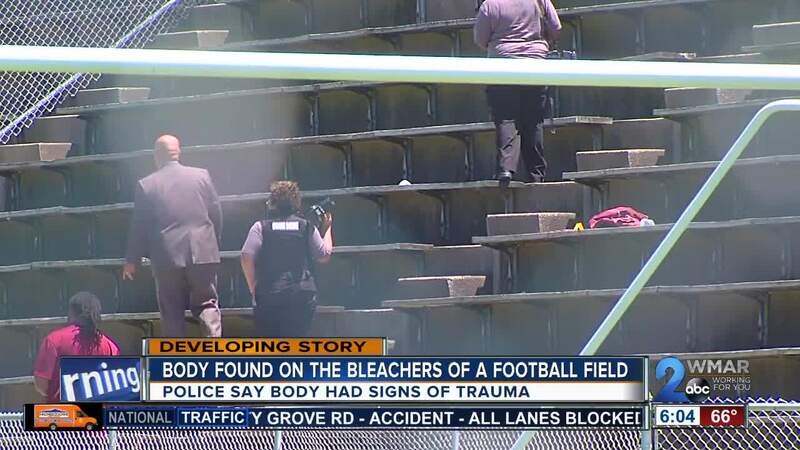 A body was found on the bleachers of a football field Tuesday, prompting Baltimore Police to investigate. Police say the body was found around 11 a.m. on the field near the 2400 block of Westfield Avenue. Homicide detectives responded to the scene to investigate, and they determined the body had signs of trauma, ruling the death a homicide. A person walking their dog by the football field off Westfield Avenue saw the body Tuesday morning and called 911. The victim was found by the bleachers and police say he or she was unconscious and died a short time later. The field sits across from Reginald F. Lewis High School but is not connected to the school; we're told its mostly used for little league games. People we spoke to who live in the neighborhood say they are surprised by this discovery. “This neighborhoods quiet we don’t have any problems and usually there’s nobody in the field unless there’s somebody walking their dog over there," explained neighbor Kim White. "There’s not a lot of people that hang out in the field"
At this point, we know nothing about the victim only that he or she was an adult. Anyone with information about the incident should contact police at 410-396-2100 or Metro Crime Stoppers at 1-866-7LOCKUP (1-866-756-2587), or use the anonymous text tip line at 443-902-4824.